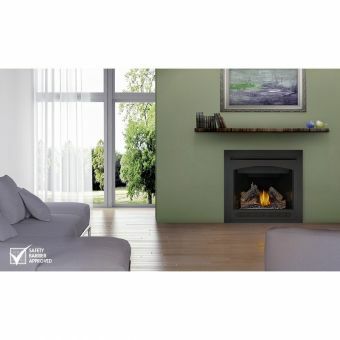 Vented Gas-fired Napoleon fireplaces vent combustion gases directly to the outside of the home. 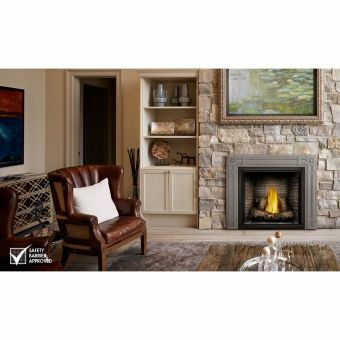 Napoleon fireplaces have enabled far greater flexibility in the placement of home heating units because they don't need access to a masonry chimney or a freestanding flue above the roofline. Prefabricated from metal, they use zero-clearance technology and have a glass door that securely seals the combustion area from interior rooms. Air for combustion is drawn from the outside. Air for convection is drawn from inside the room, circulated through passageways around the firebox and heat exchanger, and then returned it to the living space. 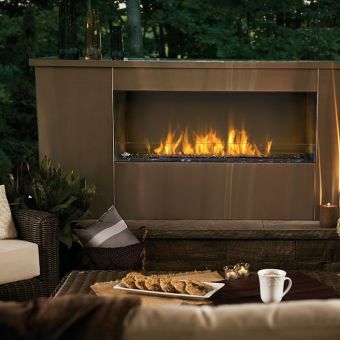 Napoleon fireplaces burn very efficiently, extracting most of the heat from the combustion gases. 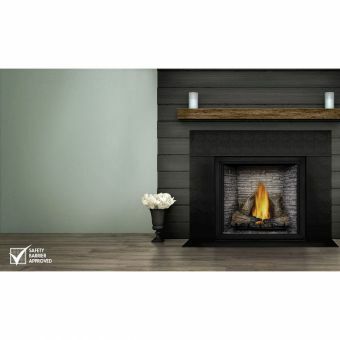 Unlike wood-burning stoves, they produce virtually no particulates, require little user maintenance or clean-up, and are simple to operate, using a switch, or even a remote control, and a thermostat. 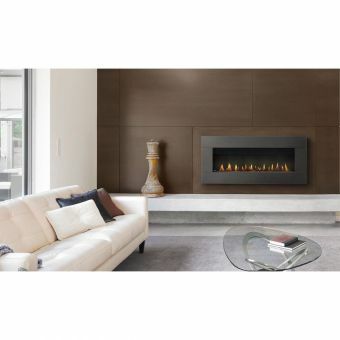 Napoleon Direct vent gas fireplaces come in a great many of styles, both modern and traditional. One-sided models are the norm, but two-sided, three-sided (napoleon peninsula fireplace), and four-sided (napoleon island fireplace), bay-window shaped (napoleon bay fireplace, and corner units (napoleon corner fireplace), are also available. Sizes vary from about 30 to 48 inches (76 to 122 cm) wide, about 24 to 30 inches (51 to 76 cm) high, and about 13 to 18 inches (33 to 46 cm) deep. Top-venting types work well where there isn't a straightforward access out of a wall. Depending upon the model, vents may run vertically or horizontally for quite a distance - up to 25 feet (7.6 meters) or more. Fans are installed to boost the circulation of heated air may come as standard or as an option. Some Napoleon models have a standing safety pilot light that burns continuously to light the main burner whenever the gas is turned on. Others have electric spark ignition, to save energy, or a piezo electric ignition, which doesn't require an electrical hookup. Some units use a millivolt generator so the fireplace can operate even if mains power fails.